We are coming into the season when there will soon be sweets surrounding us. Celebrations to attend, cocktail parties to dress up for and holidays to celebrate with friends and family. This means two things for me: (1) I need to have some good hostess gifts up my sleeve and (2) I need to have some sneaky, nutritious desserts to set out when we host or to bring when we attend an event. 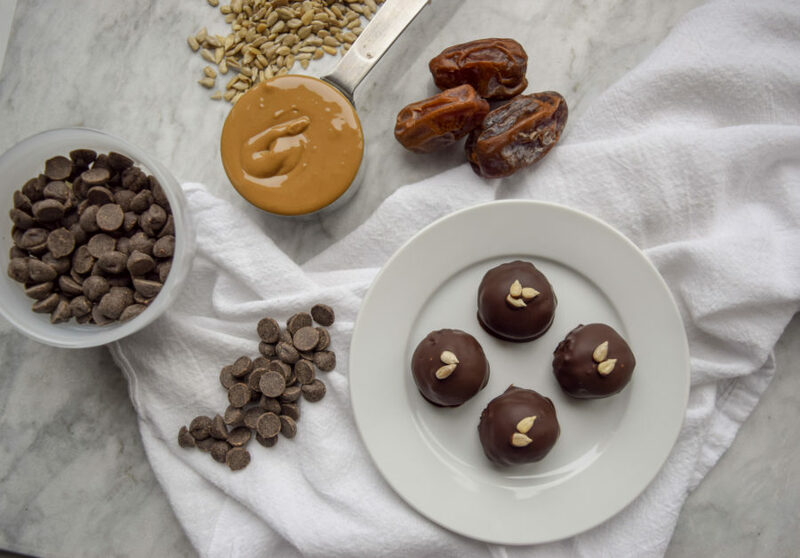 Enter my sunflower seed butter-date truffles. I know that’s a mouthful to say! 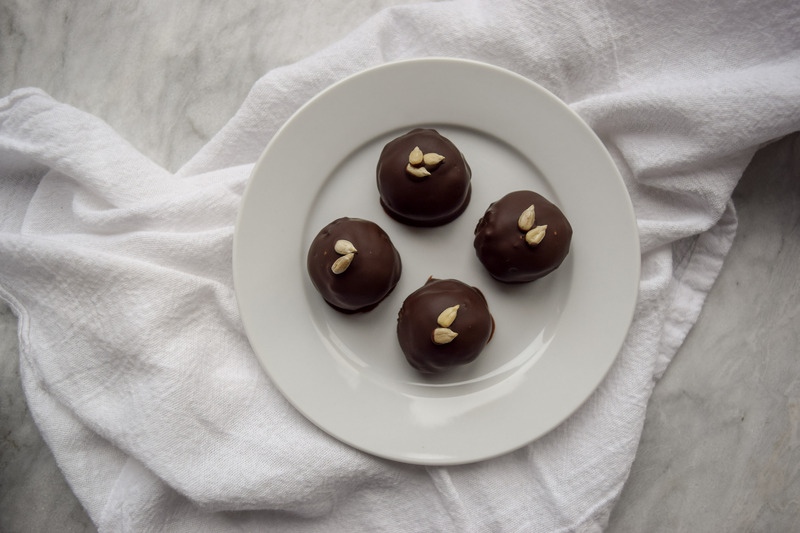 These little beauties are great because they look like a classic truffle, are covered in dark chocolate but inside are bursting with nutrient dense sunflower seed butter and dates. It couldn’t be simpler! The great thing about these is that you can also make them partially ahead of time. The filling can be portioned out and rolled and then placed in the freezer until you are ready to coat them in chocolate. This way, when you have a party to go to and the panic of “do I have a hostess gift?” sets in all you need to do is pull a few of these little guys out of the freezer, melt a little dark chocolate, coat them and let them set for about 20 minutes. I promise you’ll take the prize for the most delicious and nutritious gift! Happy Food is the Best Food! *optional: you can add a little adaptogenic mushroom powder or collagen powder to the date mixture if you’d like to amp up the nutrition quotient! Soak the dates in boiling water for 5-10 minutes until soft. Place the soaked dates, sunflower seed butter, vanilla extract and sea salt in the bowl of a food processor. Process until super smooth. Line a small tray with wax or parchment paper. Scoop out the mixture using a tablespoon onto the prepared sheet. Place in the freezer for 30 minutes until chilled then lightly roll into a smoother ball shape. Place back in the freezer. Melt the dark chocolate and the oil together either in a double boiler or in the microwave at 30 second intervals. Coat the date-sunflower balls in the chocolate and place back on the tray. Top with flaky sea salt and the toasted sunflower seeds. Continue until all the balls have been coated. Keep in the refrigerator until ready to enjoy!